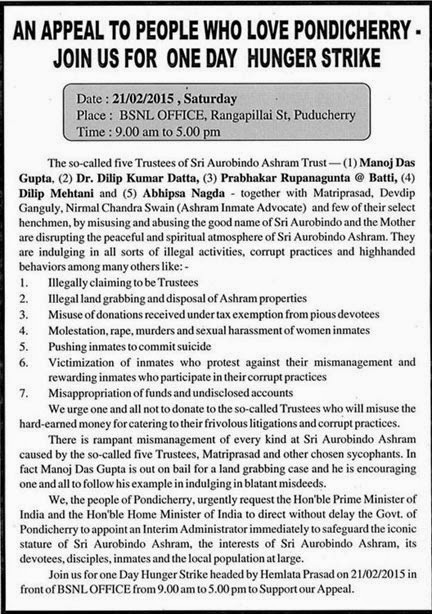 PUDUCHERRY: The sisters, who have been evicted from Sri Aurobindo Ashram-run premises, along with members of civil society organisations on Saturday observed a token fast in front of the BSNL office here demanding the Centre to direct the Puducherry government to take over the administration of the Ashram. MODERN culture demands that one should not be bound to one creed or dogma, swear by one principle or rule of life or be led blindly by one man. Truth, it is said, has many facets and the human being is also not a Cyclops, a one-eyed creature. To fix oneself to one mode of seeing and believing and even behaving is to be narrow, restricted, sectarian. One must be able to see many standpoints, appreciate views of variance with one's own, appraise the relativity of all standards. Not to be able to do so leads to obscurantism and fanaticism.